Watch the screencast and read the documentation for the guest user plugin and the contribution plugin. Worried about spammers? Read this documentation on enabling ReCaptcha. 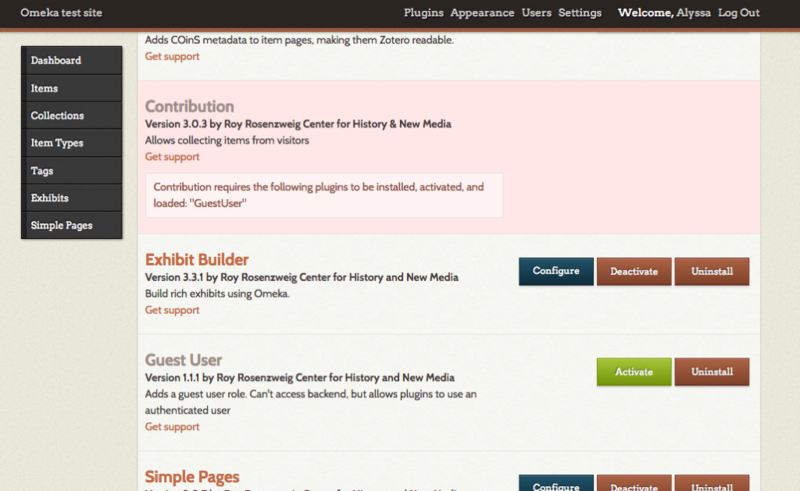 Go to Plugins page on omeka.org and locate the guest user and contribution plugins. Download both plugins to your desktop. They should be zipped files. Go to Reclaim, log in to the client area, navigate to the cpanel, and then click file manager. Click upload (top menu bar), and then either drag and drop the files from your desktop or select the files for uploading. Once the upload has completed, click the link at the bottom of the page to return to the previous screen. You’ll see a zip file for your plugins in the plugins folder. Click extract (top menu bar) to extract the plugins. If you get stuck on this step, read Reclaim’s documentation on installing Omeka plugins. Navigate to the admin side of your Omeka install, and click on plugins (top menu bar). You should see the guest user and contribution plugins. You’ll first have to install and configure the guest user plugin before installing the contribution plugin, so we’ll come back to the contribution plugin in a minute. Click install on the guest user plugin and then you will be automatically redirected to the configuration page. You can enter text into the following fields: registration features, short registration features, dashboard label, login text, and register text. There are also checkboxes for allowing open registration and allowing instant access. Once guest user is installed and activated, you can manage guest users by going to the guest users tab (left hand side navigation menu). Clicking this tab brings you to a browse users page, with a table of the guest users displaying their user ids, username, real name, email, and role. 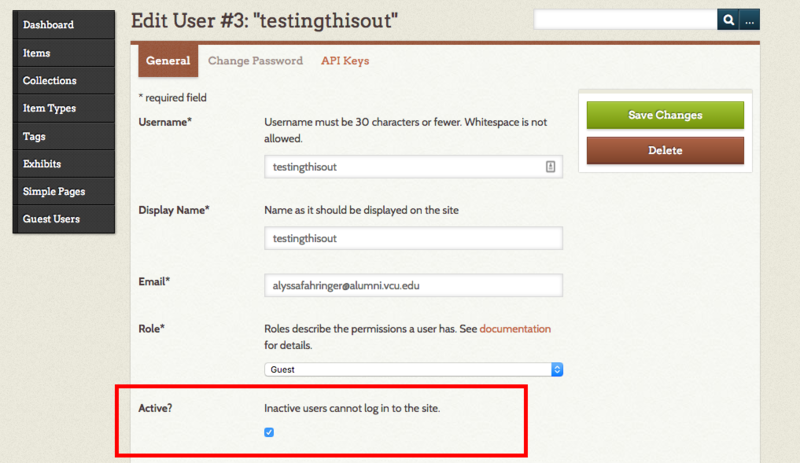 You can also search through the users by username, real name, or email address. To edit a user, click the edit link below their username. 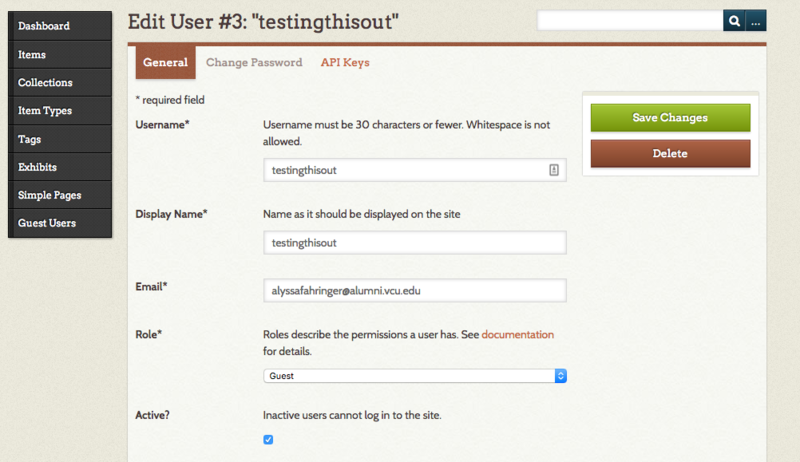 There are three tabs on the edit guest user page: general, change password, and API keys. Under general you can: change the username, change the display name, update the user’s email, change the role of the guest user (not recommended), or make the user active or inactive. Under the change password tab, you can enter a new password for the user without knowing their current password. You can delete a user by either clicking the delete link under their username, or by clicking edit and then delete. Activating guest users – only pertinent if you have not checked the allow open registration box when configuring the guest user plugin. Once users have begun signing up to contribute items, you will receive an email asking you to activate their account. Navigate to the admin side of your Omeka install, and click guest user (left hand side navigation menu). Under the username of the guest user awaiting activation, click the link that says edit. From here, click the box that says activate and save changes. The guest user will receive an email saying their account has been approved by an administrator. Navigate to plugins and activate the contribution plugin. Click on the contribution tab (left hand side navigation menu). The contribution page has three different tabs: getting started, contribution types, submission settings, and contributions. Getting started: Instructions for setting up the form and submission settings. Contribution types: To include questions on the public form, first choose the types of items you wish users to add (document, image, sound, moving images) and then create questions whose answers map to specific metadata fields. Click on the contribution types tab to select the item types you want contributors to select from on the public form. Read more about managing item types in Omeka here. Story and image types are already selected and you can add other existing types. Click add a type. Select item type, display name, and whether or not to allow file upload when this type is selected on the form. By adding an element, you can add metadata fields for information you wish to collect for those specific item types. Submission settings: You can enter text in the following fields: contribution slug, contribution confirmation email, new contribution notification emails, text of terms of service, email text to send to contributors. You can check the box to use simple options, and you can also designate the collection contributions will go into and a default contribution type. Contributions: This is the tab is where you can view all submissions that have been received through the public contribution form. It is possible to review and make items public or change their status. All contributions will also be available to browse and search on the items tab in your Omeka site.